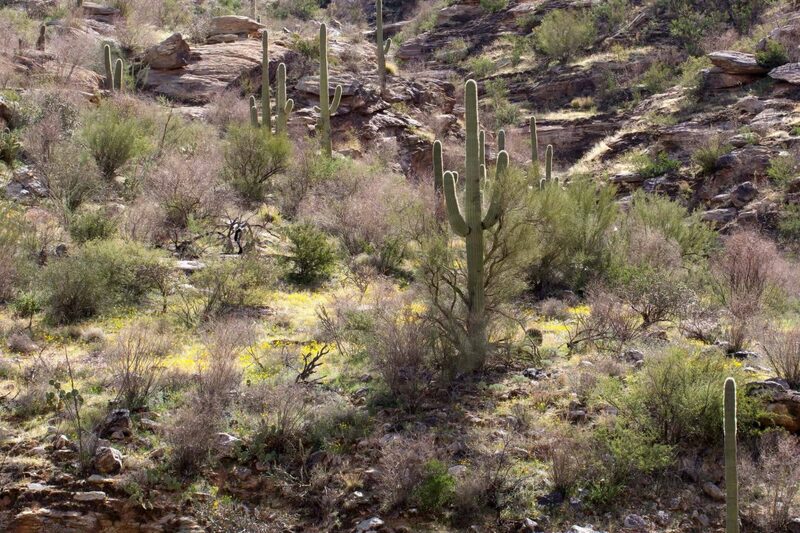 Sabino Canyon supports a wide variety of wildlife because it is a botanically diverse natural landscape. However, the recreation area is subject to continual ecological disturbance by intensive human use and natural flooding, both of which encourage invasive plants that deprive wildlife of food, shelter and reproductive opportunities. Keeping wildlife habitat healthy requires controlling invasive plants that crowd out natives. SCVN promotes conservation through public interpretation about invasive species and we also help identify and remove them. Download: Sabino’s Problem with Invasive Plants. 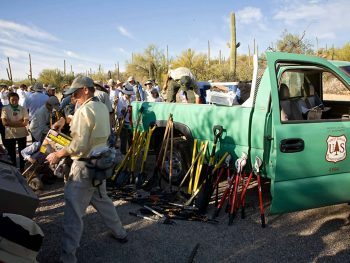 Learn more: Sabino Stewards’ volunteer opportunities with Sky Island Alliance. Native Sonoran Desert plants have returned to Sabino Creek in great profusion in creekside locations that were once overrun by 25-ft. high thickets of the invasive Giant Reed. From 2008-2010, hundreds of people volunteered for the difficult work of removing the non-native cane. Sharon Biedenbender, former Ecologist and Invasive Species Coordinator for Coronado National Forest, developed a presentation on the danger Buffelgrass presents to the canyon. The transformation of rich Sonoran Desert upland habitat of 15-20 plant species into an impoverished landscape containing only two to five species. The longer Buffelgrass remains on a site, the more species richness and diversity decline. The rate at which Catalina Mountains Buffelgrass is spreading. Doubles in acreage every 2.26-7.04 years.